Soho is So So…Yummy. Especially if you are dining with fun girlfriends. On another one of my work trips, I found myself in a part of Manhattan that I had only briefly passed through on other visits. Not this time. I stayed at the beautiful James Hotel. And dined, with some of my favorite workmates. Here’s the short list of places our friend Christine researched for us. She’s been in New York for the last few years, so was by far the most qualified to make dinner recommendations. Balthazar, 80 Spring St., New York, NY 10012 at Crosby St, 212-965-1414. Here’s their Yelp reviews. Aquagrill, 210 Spring St., New York, NY 10012 at Sixth Ave, 212-274-0505. Here’s their Yelp reviews. Blue Ribbon Barsserie, 97 Sullivan St., New York, NY 10012 nr. Spring St., 212-274-0404. Here’s their Yelp reviews. Osteria Morini, 218 Lafayette St., New York, NY 10012 nr. Kenmare St, 212-965-8777. Here’s their Yelp reviews. Aquagrill won the day. And it didn’t disappoint. Start with fresh, raw oysters. I’m a West Coast girl, but let the waiter help with your selection. But, don’t let him help with the wine. 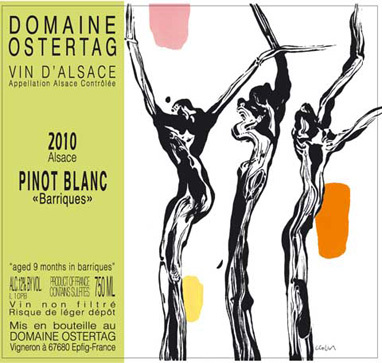 Order this: Domaine Ostertag vin d’ Alsace Pinot Blanc “Barriques” (2011). Really, you owe it to yourself. One of my girlfriends went home and ordered a case. I have one on order too. Its so perfect with seafood. For your main course, order your favorite fish. Or, select from their fresh daily offerings. All four of us ordered something different; all four dishes were delicious. The staff and the clientele are warm and friendly. Yes, I just said that about a NYC restaurant. You’ll learn what I mean while waiting in line to use the Ladies room. Its single occupancy, which means you have plenty opportunity to get to know the other female restaurant patrons. We’ll keep adding to our New York favorites. If you haven’t yet, check out our “One Perfect Day” post on New York.